Members of the Ohio County Schools afterschool program, including representatives from the Center for Educational Technologies and Challenger Learning Center, met Thursday with West Virginia Gov. 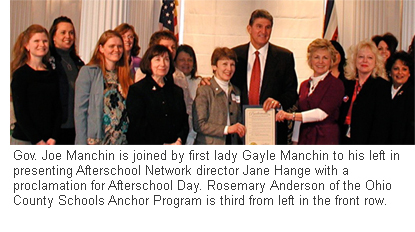 Joe Manchin and members of the legislature as part of Afterschool Day at the Legislature. The governor and first lady Gayle Manchin greeted representatives of the Ohio County Schools Anchor Program along with teachers and students from other afterschool programs across the state. The Anchor Program offers academic tutoring and enrichment activities at Wheeling Park High School. It's the first year for the program at the high school. The Anchor Program has already been in place at Triadelphia Middle and Madison Elementary schools. Leading the Ohio County delegation were Rosemary Anderson, director of the Anchor Program, and 18 students from the schools involved in the program. Also at the Capitol were Laurie Ruberg and Jackie Shia of Wheeling Jesuit University. Ruberg, the associate director of the Center for Educational Technologies at WJU, manages the Ohio County Neighborhood Mapping Project as part of a partnership between the Center for Educational Technologies and the Ohio County Anchor Afterschool Program. Park students are using multimedia and Internet tools to create an online interactive map of their Wheeling neighborhood for the afterschool program. The Neighborhood Mapping Project is supported by a $10,000 Explorations grant made available to 21st Century Community Learning Center programs, of which Anchor is one. The Benedum Foundation also provides support. Shia, director of the Challenger Learning Center, has provided e-Missions for the Wheeling Park Anchor afterschool students. "It is wonderful for WJU/CET and the Challenger Learning Center to be part of this statewide celebration and promotion of afterschool education," Ruberg said. "We're excited to have the opportunity to get the attention of the governor and legislature about the importance of learning that happens in valuable informal education programs. As a partner with the Ohio County Schools Anchor Program, WJU/CET is able to get high school students involved in the Neighborhood Mapping Project as well as Challenger e-Mission simulations." Wheeling Jesuit students are contributing to the Anchor Afterschool program in a variety of ways. Preservice teachers are offering academic tutoring services for high school students. Communications interns from WJU are facilitating the multimedia-rich mapping project. Students are using video and digital cameras and recorders to interview and record stories from their neighborhoods. They'll use that information to create a visually rich documentation and mapmaking of their neighborhood's features. Their work will be posted on the Internet and displayed in an exhibit for parents and community members to view when completed. After the meeting with Manchin, the afterschool representatives were recognized at the sessions of the House of Delegates and state Senate. In addition, many of the afterschool programs set up displays in the Capitol building. The event was organized by the West Virginia Statewide Afterschool Network.